in our National history. We all have stories of where we were, what we were doing and how it impacted us. Yes, I literally crushed the redial button on my cell phone trying to reach my father, who worked at the Pentagon in Washington, DC at the time. For once I was happy for traffic – he was stuck on 395 at the time of the attacks. It is not an overstatement to say that the terrorist attacks of that day literally changed the Nation and the world…forever. It was those heinous actions that tore off the face of naivety on the American citizen. I remember many many people reacting in either one way or another. Either they turned to God in their pain and confusion – or they turned away from Him claiming He either was an evil entity for allowing the attacks to happen or worse that He didn’t exist at all. But herein is my point. 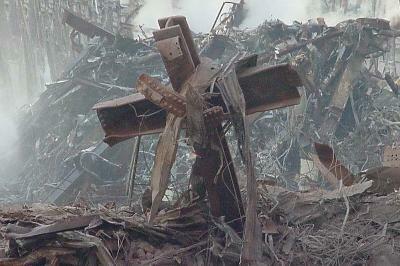 In the middle of the destruction and death, God also showed His face and His heart. We saw Him through the selfless actions of the firemen, the volunteers, the policemen…the unknown friend on the street. Formally self-absorbed people, people of all races and religions came together for the greater good…they housed strangers, fed the lost, protected the vulnerable. The crew and passengers of United Airlines flight 93 literally gave up their lives for countless people who would have been effected by another plane attack into the US Capitol Building. I have heard it said that God will move hearts when it is most needed. He gives saving grace, dying grace, living grace. Am I saying the the 9/11 attacks are an act of God? No – what I am saying is that evil exists. Bad things happen to good and bad people. But God. He can and does use evil for good; He can save the fallen, heal the sick, comfort the mourning and fill the hearts of the broken and lost. He does this. It is part of His job description, it is His character. It is up to us to make way for His will, and push away our own. So on this day, yes – we should remember those we lost and rejoice in their lives while they lived. We as a Nation should learn from the past and make changes for our future. Let us not forget the lessons that we learned that day too. That the human heart CAN rise to be better. That we can put prejudice and self service aside for the greater good. That when we see our neighbour hurting, we don’t need a National tragedy to lend a hand, our hearts or our time. Let us remember a lesson for all nations, that united we stand, divided we fall. We owe that to all those who lost their lives or their loved ones as a result of this attack…whether in a tower, plane or building…or on a battlefield. Let us also remember that God can (and will) use all things for good (Romans 8:28) – for those who love Him…and for those who maybe aren’t quite there yet either. He heals the broken-hearted and binds up their wounds. He determines the number of the stars and calls them each by name. Great is our Lord and mighty in power; his understanding has no limit. The Lord sustains the humble but casts the wicked to the ground. Sing to the Lord with grateful praise;make music to our God on the harp. He covers the sky with clouds; he supplies the earth with rain and makes grass grow on the hills. He provides food for the cattle and for the young ravens when they call. His pleasure is not in the strength of the horse, nor his delight in the legs of the warrior; the Lord delights in those who fear him,who put their hope in his unfailing love. God's View vs. World View, Life lessons, Observations, What Is Truth? Reblogged this on Catholic Glasses. Thanks for the reblog as always. You sure do have some hard hitting entries on your blog. Well done! Blessings on your day! Thanks. Glad to do it. I try to do my bit to cut the crap on Media Propaganda. Although, I do get fed up with it some days.